This little landscape painting is a significant milestone for me. It is my 100th painting for Running With Brushes. Yes! That feels like a big mountain – and I climbed it. 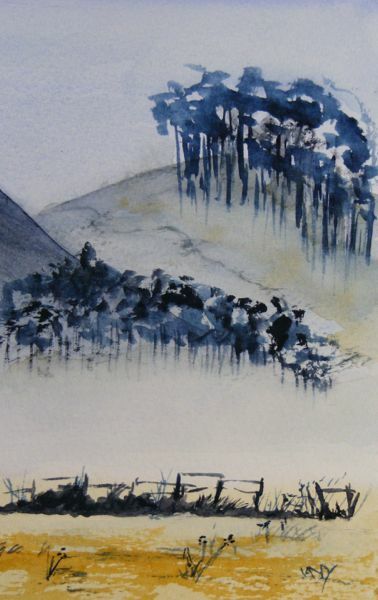 This landscape painting is a painting of two journeys. It is a milestone on the way to the 1000 paintings goal, and there’s a journey in the painting itself as well. The gap in the fence creates a space for the viewer to step though, leaving the every-day grassy field to walk through the mist and up the pathway that leads over the hill – to who knows where. I love putting pathways to somewhere unknown in my paintings, just to provide little glimpses of the possibilities that lie beyond. That’s the beauty of landscape painting. Oh wow… I just love it….. Got too many favourites now lol..